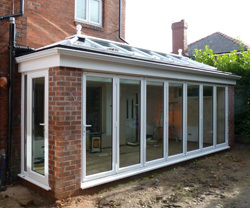 We can install bi-fold doors into an existing opening or create a new opening with all the necessary building work catered for in-house. We only use quality products manufactured for us by Kat UK the countries leading manufacturer of uPVC & aluminium bi-fold doors. For more information & specifications click HERE. These beautiful doors can be manufactured up to 6 metres wide, with a minimum of 2 up to a maximum of 7 individual door panels. Our unique roller system means that you can opt for a number of opening configurations to suit your property or design preferences. 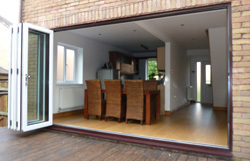 2 door bifolds make ideal and exciting replacements for older patio or French doors. 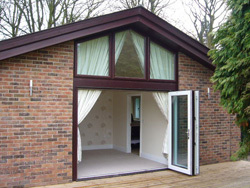 The standard weathered PVCu threshold has been designed to be as low as possible but we also offer a special non-weathered low threshold for internal room divider applications. Our Universal doors can be easily folded back concertina style, optionally made to stack the door sashes either inside or outside your property. We offer a wide range of colours and finishes. Some finishes are also available in dual colour, where the inside and outside can be ordered in different colours. Unlike many other PVCu bifold door systems, Universal bifolding doors have equal sightlines on all vertical mullions. These profiles are very slim, which adds to their overall aesthetic appeal. Universal bifolds are fitted with integral anti-jemmy bars to ensure that individual doors cannot be lifted off the track by intruders. The PVCu sashes are extruded to a very high quality standard and are all fully steel reinforced for extra strength and security – these doors have achieved PAS 23/24 high security and extreme weathering test standards.